DUG Insight User ManualFrequently Asked QuestionsFrequently Asked Questions Views and DisplayHow do I pick contours in Insight? You can't pick contours directly, but there is a workaround that you can use. 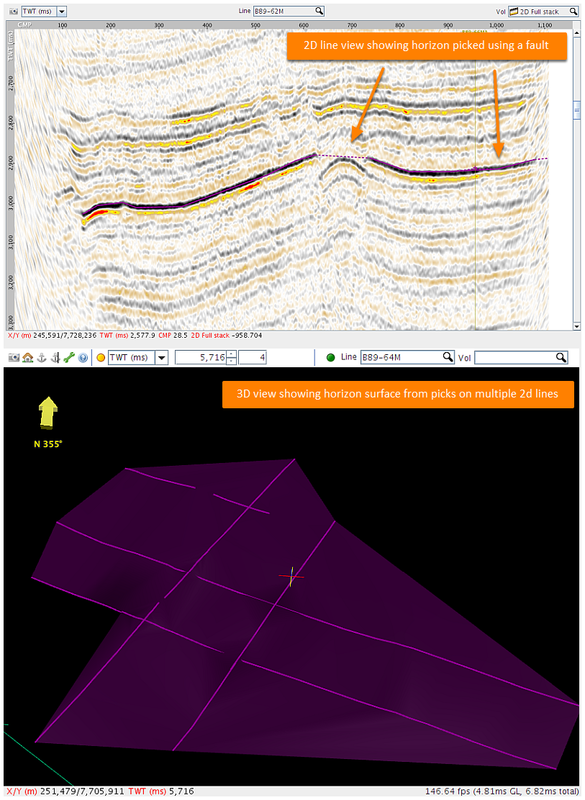 If you pick the horizon as a fault, you can use the map view to create the contour lines as fault picks which you can manually pick. Depending on the picks, the fault surface may not display sensibly, but the sticks will contain all the necessary points to create a good horizon. To do it, export the fault to a file -- make a small change, and import the result as a horizon. 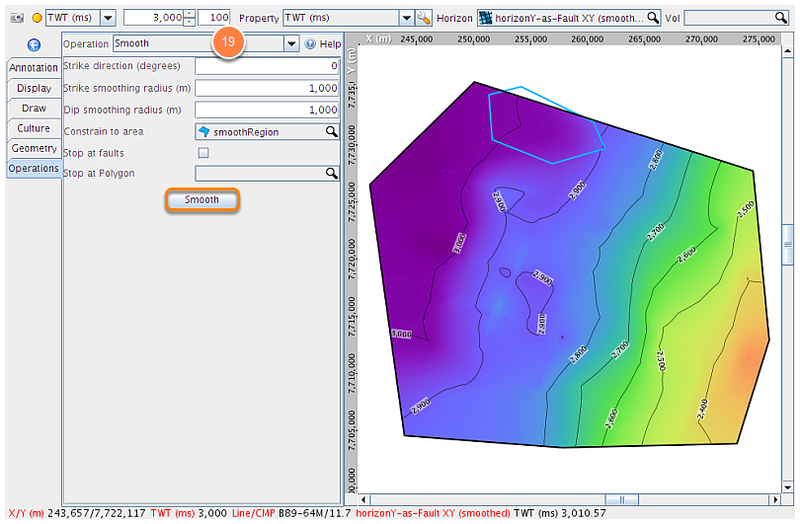 Regrid to X/Y and extrapolate to complete the surface. From the Fault tab, click the "+" button and create a New Fault. Read more about Faults. Type a name for the fault (e.g. "horizonY-as-fault"). In section (i.e. 2D Line View or Arbline view), create fault sticks for the horizon on the available lines. 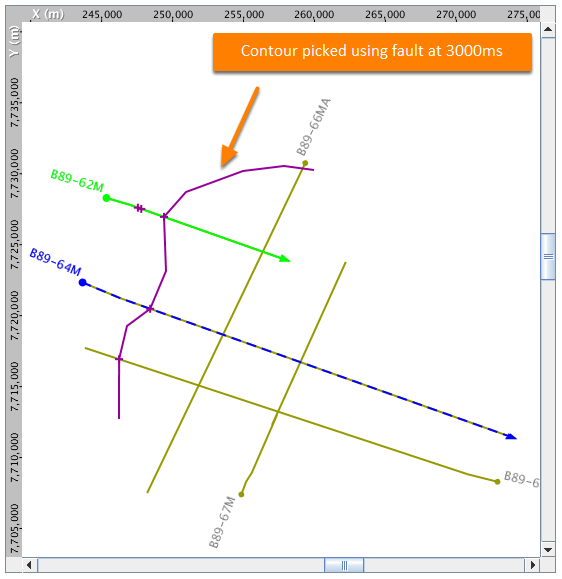 In Map view, select the contour TWT and create a new fault stick. 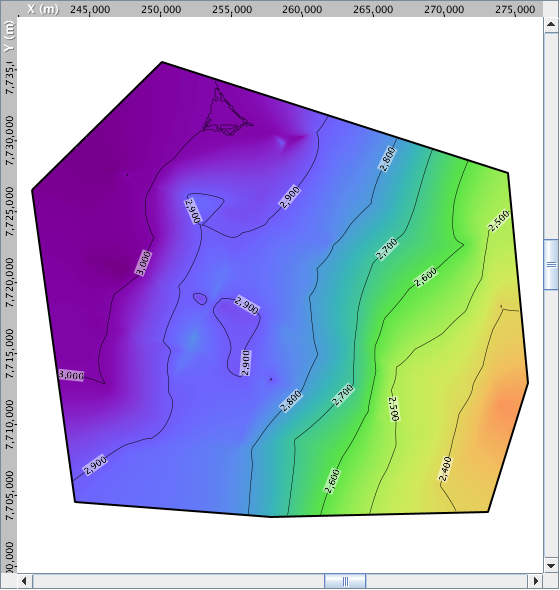 Repeat at different TWT values for additional contours. Repeat until the level of detail is satisfatory. When finished picking, go to the Fault tab, right-click the fault and export it to a file (e.g. "horizonY-as-fault.dat"). From the Control Panel drop-down menu, select Import >> Horizon and choose the edited .txt file. 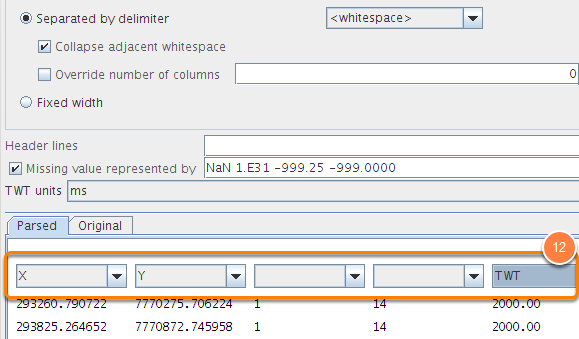 In the Import screen, set the column types as X, Y, (blank), (blank), TWT and click OK.
Go to Map View and check the result. Next step is to regrid to X/Y. Select the Operations tab in the Map View and choose Regrid from the Operation drop-down box (if not yet selected, choose the imported horizon from the Horizon drop-down box). 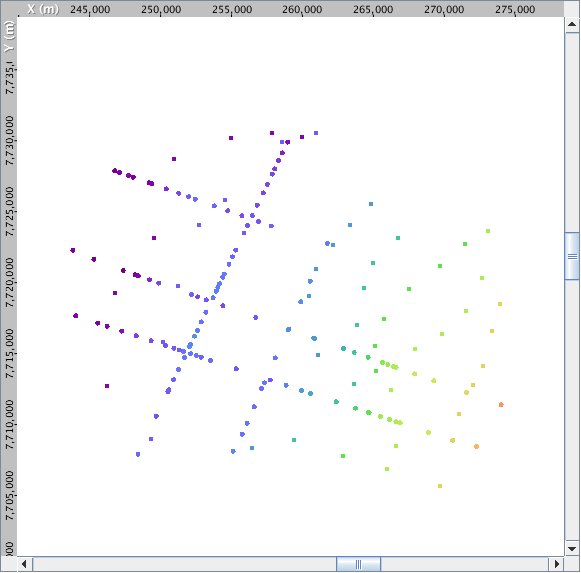 Select X/Y as the Output Survey. For regional horizons, try an increment of 100m x 100m or larger. Set these for both X and Y extents in the Step textbox. Draw a polygon around the imported horizon to Regrid. 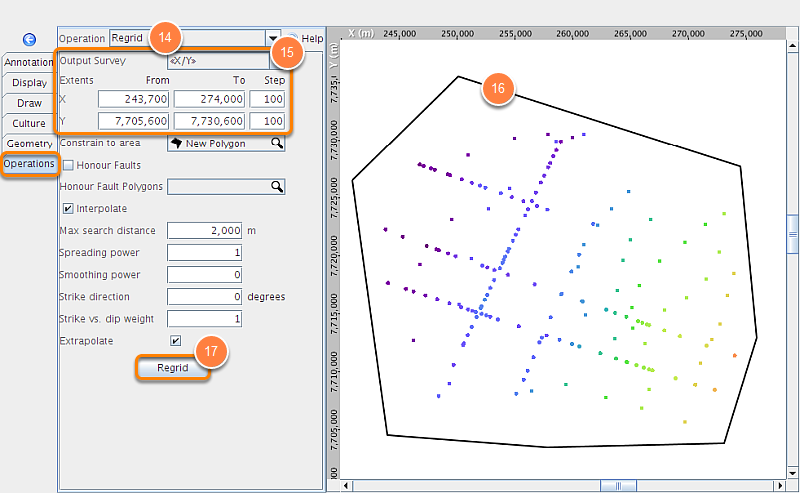 Right click on the Map View and select Create a New Polygon. Read more on Polygons. 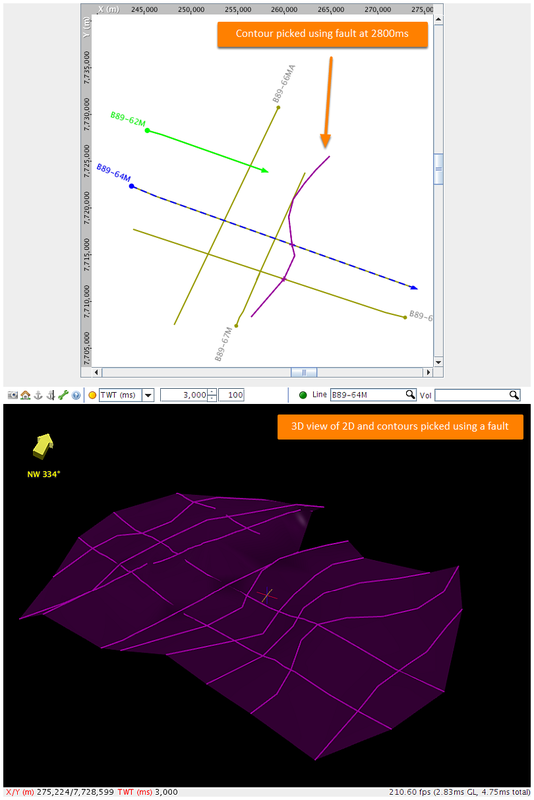 Select this polygon in the Contrain to area box and click Regrid. Insight will interpolate/extrapolate the horizon within the polygon. Review the result once completed. Apply some smoothing if the contours are irregular via the Operations drop-down option. Read more about Smoothing (Horizon). Prev: How do I display a horizon with its contours in 3D View? Next: Why does SEG-Y Loader tell me I have a duplicate survey even though the coordinates are not the same?